Lately I’ve been thinking about ways to describe yoga. Especially to new people who are asking questions about yoga. What is yoga? Will it help me lose weight? What do you do in a class? Why do you spend so much time teaching/studying/practicing? When I first started thinking about how to describe yoga to people, my purpose was to come up with ways to “market” yoga and Iyengar Yoga. I wanted to help people find us, come to class, and introduce them to our practice. I think about marketing sometimes. As a studio we depend on having students. Without students, there is no studio. And it is no secret that the practicalities of paying the rent, keeping the lights on, utilities and so forth are important considerations. It is in the “marketing” of yoga where I get stuck. It’s hard to describe Iyengar Yoga to those who have not experienced it for themselves. heal from injuries & chronic conditions. I can cite articles with the scientific research backed by statistics on percentages of people who have achieved relief from pain and calmed their anxiety. The usual attention-grabbing advertising words do not work here. But there are benefits other than the surface ones. These are hard to describe. Common advertising language has no words to describe yoga practice. Sure, the physical benefits attract people, but those who continue to practice over a period of months and years do so because the yoga gives them more than a healthy body. Even these descriptions fall far short of describing what yoga brings. Yoga is the ability to quiet the mind. It helps us provide a deeper experience of who we are — and we turn inward. Wanting to shift my attention inward. Wanting to focus less on the externals. I have not always been interested in this. It can be scary to go to an unfamiliar place. And spending time with myself and my ever-wandering mind has never souned appealing. What will I find there? Maybe nothing. Maybe something I’d rather not see. Or maybe I can catch a glimpse of a new, less external (what am i wearing? how can I be fit?) way of living. Inner connection has never been on my to-do list. Until now. And I can see that is a process — it comes in stages. My first stage toward change has been to wish I wanted to. And in the case of big changes, I am only capable of being willing to want to change. These stages can last a very very long time before any real work happens. I find myself in the middle of it now. Maybe you do too. It helps to hear what others have to say on the subject. The “Can I?” question comes up in yoga class a lot. “Can I do it?” you ask. The problem with asking “Can I?” is that it implies that there is a simple answer. But a quest for personal growth & change can bring more questions than it does answers. This shift in thinking comes straight out of my Iyengar Yoga learnings over the years. It acknowledges I am looking toward change/growth. It reminds me that I am not just “going for it” or “giving up.” I am seeking to improve. The “can I” question makes things seem too pat. And they are not. BKS Iyengar’s work illustrates that there is always a how. In the how, we are encouraged to be curious and interested about our challenges. We are asked to challenge our judgements about what is possible. We can shift beyond judgement about what we can and cannot do. We get creative about what we might try now. This kind of exploration leads to small steps toward what we are looking at. And any small step toward something put in front of us is one step closer than before. Small steps add up to big changes. Changes over time will lead to transformation. This is precisely why I choose to study/practice Iyengar Yoga. Yoga teaches us to go beyond the resignation of “I can’t.” Yoga moves us past “I can,” as we are asked to improve ourselves rather than maintain our status quo. How can I grow at a pace that feels right for me at this time? How can I work hard and let go of the outcome? How can I keep moving forward when things seem to be at a standstill? How can I keep from sliding backward into complacency? How can I create more time to do the things I really want to do? Creativity is required. The possibilities are endless. I have found that these questions are a never-ending process that always takes me to a better place. Contemplating just one of these questions leaves me feeling stronger, positive, and more content. My recent shopping trip took me on an unexpected turn toward the existential. It’s not every day one sees luck and faith available for purchase — and with faith on clearance. The iphone in my pocket begged to take a picture. I would have loved sending it to Instagram (or Facebook or Twitter). And the right hashtag (#Targetfunny or #faithluckonsale) to underscore the experience. But there were errands to run, and I thought maybe I’d circle back to the idea later on. And just like any yoga nerd, I felt it lingering in the back of my mind. Why couldn’t I just be contented with having a good laugh about it with my husband? Because I have to create meaning out of the mundane, and often where this is none. That’s just how I roll. Still, who wouldn’t be captivated? I found the holy grail of a happy life – in the aisles of the East Memphis Target! Clearly some sales executive higher-up deemed luck to be a little more valuable than faith. The powers-that-be slashed a few prices — and voila — the value of faith declined by 50%. I knew the Pantanjali’s Yoga Sutras had something to say about this and wondered if he’d also thrown in any ideas about luck. I found some talk of faith. And very little on luck. The word “faith” can be a loaded word for many. It can be seen as something religious or spiritual or even out-dated. It brings up early childhood experiences in incense-filled cathedrals and Jesus’ “faith of a mustard seed” speech. Substituting the word “trust” has been a good alternative for me. Trust can be something like a seed that develops little by little. BKS Iyengar says that trust comes with experience. He describes faith as “felt trust” and says that it is instinctive. And then develops with effort and reflecting on one’s own experience. There have been times when I’ve found it hard to have trust or faith — even in my yoga practice. But I still do it. (Yes, and sometimes even just think about doing it). I see results. I understand faith through my experience. Over time, I am able to believe that yoga can be of help. And that makes faith worth something to me. As for luck, I’ve seen a lot of it. I’ve been at the right place at just the right time too often to doubt my good luck. Luck can provide valuable resources. But I’ve found that, unlike faith or trust, there are very few actions I can take to create more luck. Except maybe shop at Target, and be willing to pay full price. You know when you hear something for years, and you don’t quite know if it’s for real ? You hear it so many times, you start to wonder if it just might be true. At some point, I heard that Mr. Iyengar said something along the lines of this: Yoga teachers learn so much from their students that we should pay them to come to class. I’m not even sure if I heard it right — it was third-hand or second-hand. But nevermind that…it’s what I thought I heard anyway. I have scoured my yoga books looking for evidence that he actually said this, but I haven’t found it. 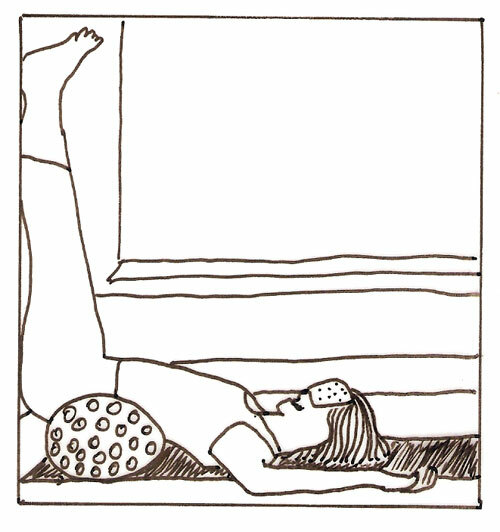 So for now I’m considering it an Iyengar Yoga urban legend – meant for yoga nerds like me. After this past week of teaching the classes while Tedrah attended a yoga intensive, I didn’t need to know whether Mr. Iyengar said it or not. Each of you showed me the power of yoga in the most potent ways I’ve seen in my (nearly) 20 years of practice and14 years of teaching. We practiced some of the most strenuous poses – many of which I rarely teach. Poses like Warrior 1 & 2, Hero, Bow (as in bow-and-arrow), Upward Bow (even more intense than Bow) and a pose actually called Utkatasana (Intense Pose). At times I have avoided teaching these. They wear me out. And poses named for battle-like behavior perplex my peace-loving self. The first tenet of yoga is non-violence. How to reconcile a warrior pose with that? It takes a lot of grit to practice this way and even more oomph to teach these poses. But as you have seen, practicing the warrior poses builds your strength of will — and can leave you feeling invigorated and satisfied. You inspired me – demonstrating the Memphis grit and grind of our community spirit. You summoned the focus it takes to keep going when you’re tired. You shifted past some limiting thoughts, and came through. Many of you accomplished new poses for the first time. I learned what is possible when you are encouraged to expect more from yourselves. And what happens when I let students know that I expect more. All of these are the qualities of a great warrior. Your work in class demonstrates the intelligence of your yoga practice on many levels: the physical, mental (how-to), wisdom (including knowing how much to do/not do), emotional and the potency of your will. It is a joy to see your progress! Thank you for sharing this journey with me and our studio. I learn so much from you.